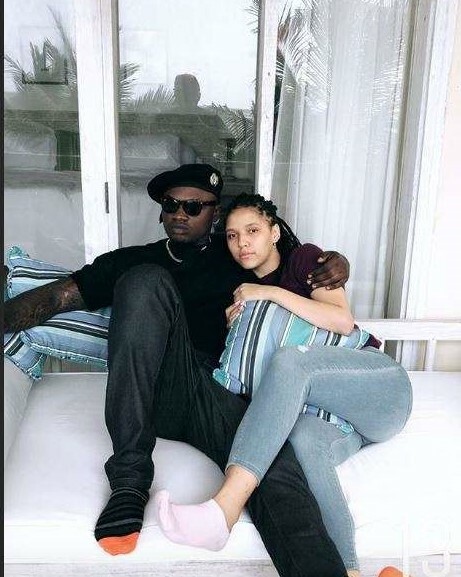 Rapper Khaligraph Jones woke up this morning missing his girlfriend, who is back in Kenya. The rapper has been in Dallas, Texas where he travelled for the 5th annual Africa Muzik Magazine Awards (AFRIMMA 2018) where he scooped the Best Rap Act award. Khaligraph posted a detailed video on his social media account, sharing what he will do to his girlfriend once he lands in the country. “Special Message to That Girl, Nakuja Kukupiga stick, Nakuja Kukupiga miti, iyo siku usidunge hata Pant**, JUU nakuja na njaa Ya fisi?,” he captioned. The rapper broke up with his former girlfriend, female rapper, Kashy, after she allegedly cheated on him an got pregnant with another man. Khaligraph has since moved on to his next squeeze, pictured above, who has been identified as Georgina. Special Message to That Girl, Nakuja Kukupiga stick, Nakuja Kukupiga miti, iyo siku usidunge hata Pant** JUU nakuja na njaa Ya fisi?